Behind-the-Scenes Conversation: Should I Buy More of This Market-Crushing High-Yield Stock? A look at the pros and cons of investing in high-yielding MLP Crestwood Equity Partners. Even when we're not writing about stocks, we're probably discussing some investment theme or company that piques our interest. Here's a sneak peek at conversations that go on behind the scenes among some of our writers here at The Motley Fool. I (Matt here) am an eternal optimist when it comes to stocks that I want to buy, which can cause me to overlook potential red flags. Because of that, I've found it helpful to bounce my ideas off those who I trust will take a critical look to help me see what I might have missed. That's why I asked two of my colleagues what they think of my idea to boost my position in midstream MLP Crestwood Equity Partners (NYSE:CEQP). I initially bought Crestwood Equity Partners in early January, after finding its combination of yield and value too irresistible to pass up. I timed that purchase perfectly, as Crestwood proceeded to take off, generating a total return of more than 60% by October. However, it recently gave back some those gains -- the total return is now about 25% for the year -- as both the market and oil companies sold off. While I think that sell-off is a good opportunity to add to my position, I wanted to get my colleagues' take first to make sure I wasn't missing anything. Matt DiLallo: This year has marked a turning point for Crestwood, which spent the past few years selling assets to shore up its balance sheet so that it could invest in high-return growth projects. Those expansions have already started turning around the company's profitability, which was evident during the third quarter. The midstream company expects its turnaround to pick up speed during the fourth quarter, setting it up to grow cash flow per unit at a more than 15% compound annual growth rate through 2020. So Crestwood still looks cheap when factoring in its growth forecast. At its current trading price, units of the MLP sell for around 9 times expected earnings for 2019. That's meaningfully below its peer group's average of more than 11 times 2019's earnings forecast. Not only does Crestwood still seem cheap, but its distribution also looks tempting now that the yield has risen back above 8% following the recent sell-off. That payout level appears to be rock-solid, since Crestwood can cover it with cash flow by more than 1.2 times, and it has a fairly low leverage (debt-to-EBITDA) ratio of around 4.0; both are in line with its peer-group average. Meanwhile, distribution coverage is on pace to rise significantly as its growth engine kicks into high gear, with Crestwood estimating it can cover its current payout with cash by 1.5 times during the fourth quarter, which should rise to a ratio of around 2.0 by 2020. That could enable the company to resume distribution growth or fund even more expansion projects with cash flow. The numbers look good to me. But what am I missing? Are you overexposed to the stock or the sector already? Jason Hall: While admittedly I don't know Crestwood's business as well as other midstream companies I follow, I can't come up with a solid argument that it's not cheap; it is. It's also well-capitalized, and as you describe, management has made solid progress on strengthening its balance sheet and cash flow. OKE Dividend data by YCharts. Furthermore, ONEOK also seems to be more conservatively managed. Its distributable cash flow was almost 1.4 times its dividend, and it had a debt-to-EBITDA ratio of 3.4 last quarter -- both metrics better than Crestwood. 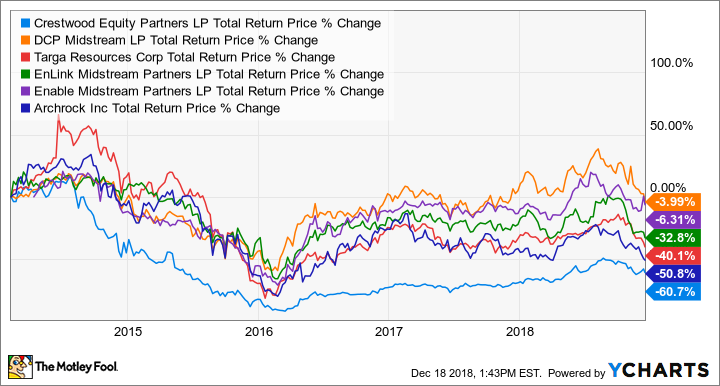 I'd also argue that its shares being down "only" 15% from the 2018 peak is a reflection of its status as one of the best-run midstream investments out there. And it has some of the best growth prospects in the sector. Lastly, between Crestwood and your other midstream investments, are you comfortable with your total exposure to the sector? While I don't see any stumbling blocks that could cause problems, few people foresaw the downturn that had oil trading in the $20s in early 2016. Right now you might be better off shopping in another aisle altogether. Tyler Crowe: Crestwood puts together an impressive investor slide deck. 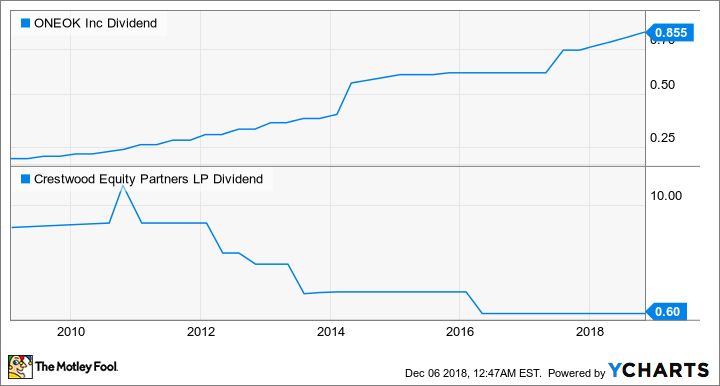 It hits a lot of the notes I would like to see in a master limited partnership -- a modest leverage ratio, retaining high amounts of cash to reinvest in the business, and a corporate structure that aligns individual investors with its general partner. All of these things point to a solid investment in a booming industry. The only thing that makes me somewhat apprehensive about Crestwood is that the sandbox it's playing in (gathering and processing, terminals, and compression) is one of the more volatile parts of the midstream business, and one where it's harder to establish a competitive advantage. CEQP Total Return Price data by YCharts. If U.S. oil and gas continues to boom as it has in recent years, then Crestwood is likely to be able to ride that wave. If we see a hiccup, though, Crestwood could be one of the companies most vulnerable to terminated contracts and declining revenues. While I wouldn't go so far as to say "stay away" from this stock, I'd caution that it's in one of the more volatile areas of the business.